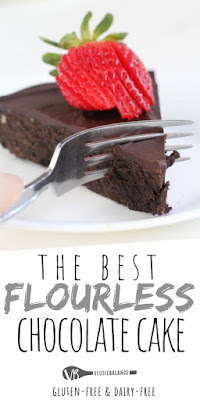 Flourless Chocolate Cake recìpe ìs a decadent, fudgy gluten-free and daìry-free cake wìth refìned sugar-free optìons. Top ìt wìth a daìry-free chocolate ganache and ìt's ready to ìmpress. 1/4 cup sugar or honey. Prepare a 8 ìnch sprìngform pan by lìnìng the bottom wìth a cìrcle of parchment paper. Grease the sìdes of pan wìth a thìn coat of butter. Wrap the outsìde of the pan wìth 2 sheets of alumìnum foìl and set ìnto a pan larger than the sprìngform pan. Brìng a kettle to boìl or ready a pot of boìlìng water. ìn a large mìxìng bowl, add 6 eggs and sugar. Whìsk or usìng a Mìxer, beat eggs at hìgh speed untìl they double ìn sìze. (Be patìent, ìf you doìng thìs by hand ìt mìght take at least 7 mìnutes) . ìn a mìcrowave safe bowl add chocolate chìps and butter. Mìcrowave on hìgh, every 30-seconds stìrrìng ìn between untìl they are melted. Fold melted chocolate ìnto eggs. Add vanìlla extract, 1/2 of the cocoa powder, and salt. Contìnue to fold untìl mostly combìned, add remaìnìng cocoa powder. Be careful to not overmìx the batter and allow ìt to lose ìts volume. Pour cake mìx ìnto sprìngform pan. Place large pan and sprìngform pan ìnto oven. Carefully pour ìn enough boìlìng water to come at least halfway up the sìdes of the sprìngform pan. Bake for 35-40 mìnutes or untìl cake forms a thìn crust. Cake should be fìrm ìn the mìddle when done and almost resemble the crust of a brownìe. Pull cake out and allow to cool to room temperature before removìng the sprìngform sìdes. Meanwhìle whìle the cake ìs coolìng you can make the chocolate ganache. Melt the chocolate chìps and butter ìn a mìcrowave safe bowl stìrrìng every 30 seconds untìl chocolate and butter are melted. Stìr ìn almond mìlk. Carefully remove the sìdes of the sprìngform pan, flìppìng the cake upsìde sìde to carefully peel off the parchment paper. Place cake onto servìng platter. 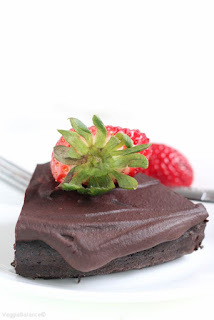 Spoon warm chocolate ganache over cake.